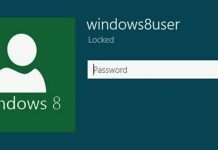 One of the main reasons you want to delete user accounts on your Windows PC is that you are possibly sharing your PC with other people who decides to leave it with the account as it is or simply the user has stop using the PC, thus leaving an unnecessary account lying inside your computer. There are numerous reasons so far and no matter how you get multiple user accounts on your PC, one thing is for sure that it will frustrate you when no one uses it while you have your own different user account. 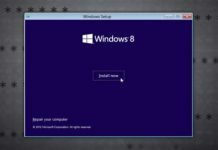 I will show you some simple steps to get rid of the user accounts on your Windows 8 PC. Before performing the steps ask the user if he or she is going to need the files and then proceed to remove the user account. Once the user account on Windows 8 is removed, it cannot be recovered anyhow. You can’t delete a user account that is already login to your Windows 8 PC. It needs to be log off first. Note: These steps can only be applied if you are an Administrator of the PC. Hit ‘Windows Key + X’ on your keyboard and select ‘Control Panel’ and change the ‘View by’ from ‘Category’ to ‘Large Icons’ or Small Icons’. 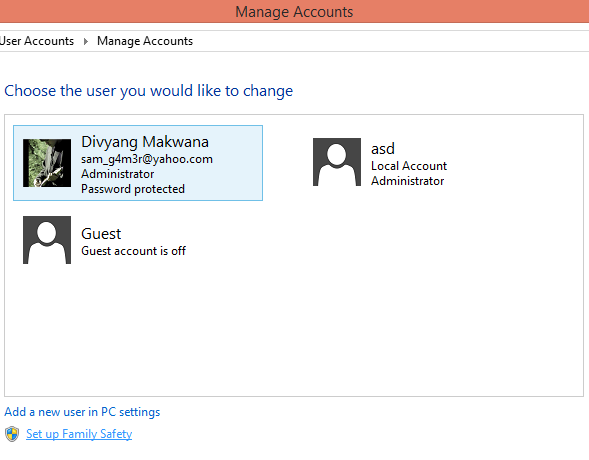 Find ‘User Accounts’ option and select where it says ‘Manage another account’. If UAC window pops up click yes. If prompted for admin password, type the password and continue. Now you will see a list of users already using the PC. 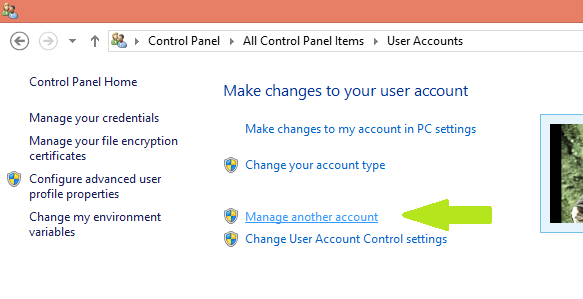 Choose the desired user you want to change or remove from Windows and click Delete the account to wipe out the user from your PC. Remember you cannot remove all the users from Windows and make sure you are removing the right user. You will be asked to keep or delete the user files. If you aren’t using the user data of selected account, press ‘delete files’, if using press ‘keep files’. The user is now permanently removed from your PC. You can similarly remove other users too. The above steps can also be used with Windows Vista, 7, and the newly Windows 10. This will help you to make sure that no one will use your PC from other accounts but only you. Password protection is advised if you don’t want someone to make another user account without your knowledge. Previous articleHow to Fix MSVCR110.dll missing error? Next articleHow to find Windows 8 Product Key that is Pre-installed on a laptop?